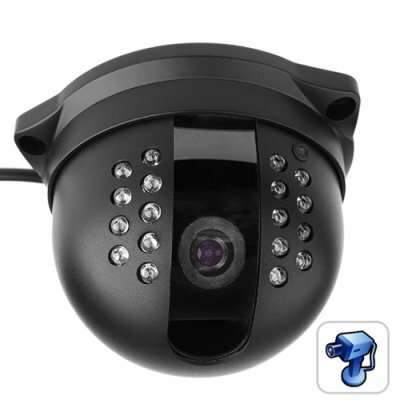 Successfully Added 1/3 Inch SONY Dome Camera - 18 LED IR Surveillance (NTSC) to your Shopping Cart. Vandalproof Dome Surveillance Camera with a 1/3 inch SONY image sensor and IR lights for night time security. With a 45 degree viewing angle and high quality color CCD imaging sensor, keeping a close eye on the your store, warehouse, or entry/exit doors will be easier than ever. The CVAJM-610 model CCTV surveillance camera includes a top-rate CCD Sony Super HAD image sensor, includes manual lens adjustment, and includes 18 infrared LED's to support night vision. This video surveillance camera is the perfect choice for small businesses, security conscience homeowners, and anyone needing a 24/7 (24 hours, 7 days a week) video feed. Provided with a low factory-direct China Wholesale Price and our famous one year quality warranty, order yours today and we will ship it out tomorrow! This product uses the NTSC color system. If you need a PAL version then please order CVAJM-610-PAL. The two micro lenses on top of each photo diode of the Super HAD CCD are able to collect more photons from incoming light than the old CCD's made by other brands. Once you see the quality of the Sony Super HAD you will never go back to old-tech video surveillance products!